Best-in-class AR programs do not take training for granted. They understand that communications and IT industry analysts can touch or be touched by many parts of the company and that a good training program is key for ensuring that all interactions with analysts are positive for the company. In addition to outbound activities a training program that includes inbound activites such as research use and effective inquiries can help you get more value from your analyst firm contracts. This breadth of training will cover all aspects of communication with analysts and involve each constituency within the company (click on the graphic to enlarge). It is important to note that training is not just for large Communications and IT Vendors, but should be addressed as part of any company, regardless of size, that deals with analysts. End-user clients doing research and competitive intelligence can benefit from a more structured approach to analyst interactions as well. For vendor AR teams training for executives and sales should be the first priorities. Training your executives on the impact of the analysts, as well as a form of spokesperson training, is critical for increasing AR visibility and support. It will also make them more comfortable deal with the analysts in a way that will surely improve the overall relationship. Sales can benefit significantly from education on how to leverage positive reports and mitigate any negative commentary. This training should be the basis of any good AR program and can later lead to a more significant sales partnership program. Training programs should be customized for each constituency, both in content and in level of detail. Making the training simple and relevant to each group is a major success factor. A typical vendor program might tailor their training to include short presentations at Line of Business (LOB) staff meetings, planning meeting for product managers, and more detailed training for marketing and sales. 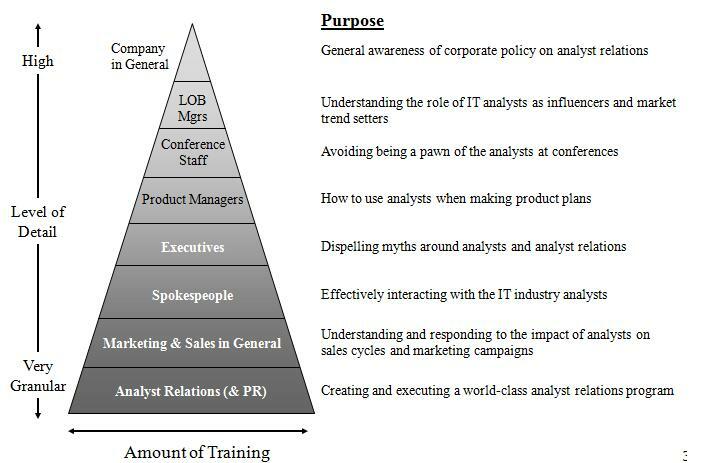 At each level be sure to emphasize the influence analysts have on the company revenues. Question: AR Teams – Do you track your training results? How do you provide training to an organization that is geographically distributed? Visit www.sagecircle.com and click on Executive Briefings to learn more about SageCircle’s services. Or, call 650-274-8309 to speak with a representative about how SageCircle can help you take your AR program to the next level.